Samsung is one of the leading company in this world and mostly in India. It provide number of electronic products from laptops to mobile phones and televisions. Out of these things, mobile phones are most popular. It has variety of phones in every budget range. If I talk about android, then you can buy number of Samsung smartphones starting from 3000 to 20k+ range. It's obvious that company or brand name is everything. If a company has better brand reputation, people are more likely to use its product as trust is added next to their name. Samsung is also a big brand and has trusted users but this case hold bad in android phone cases. Although battery life depends on number of factors like app battery usage, screen lightning ( dark or light colors ) , brightness level etc., but the most percent lies in the type of battery and its power ( more technical, mAh or milliampere-hour ). Comparing to other smartphones, Samsung has short battery life which means that it drain faster than normal and as its use increases time to time, the battery health life decreases inversely. I had already posted an article on how to improve battery life. So better read it first and improve your performance by 70% least. Here you'll find "Cached data". Click on it and a pop-up box will appear. Select "OK" Button to clear all data and finally it will free up your RAM. This will also increase your memory space. It's obvious that product value decreases after its use and even after a day you bought it but comparing to other big brands like Sony and iPhone, Samsung has very low resale value. So this is another negative impact on users especially to those who frequently change their mobile time to time. To clearly explain this more, Imagine if you have three mobiles. One of Samsung with more than 25k+ cost and other two as Sony Xperia Z1 and iPhone 5 with same budget range. Now If you want to sell all these mobile to me then which will be charged more. No doubt, it is iPhone which has highest resale value and then Sony and at last Samsung. So why to buy a product which has very low resale value? 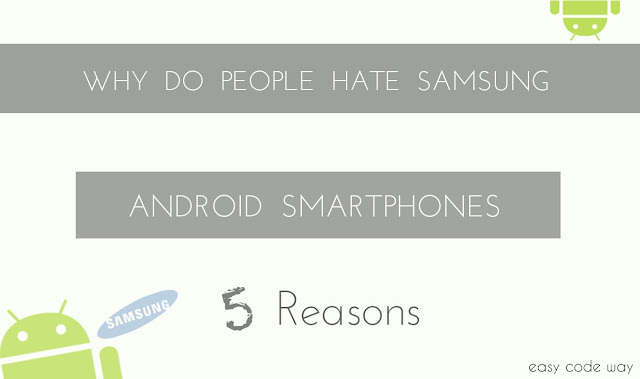 Samsung android phones are just normal and they don't have that much respect or craze in society. For same budget range, people are more excited to use iPhone and Sony devices. Now let me ask you one question. What if you bought a new costly phone and people still think that it's just a normal piece. So do you want to waste your money on such products. Definitely not and in this case, you can opt for other available options. It is Samsung who bring fastest updates in their phone series. It launch new models each week. Although it's a good things but this all will confuse customers to find their perfect choice and what if you recently bought a latest model and within few week, it launch another updated model? Indirectly, this will decrease your phone social value and as a result of which, its resale value will decrease. Now If I again compare this situation with iPhone and Sony than their social value remains same even after a new update.